Welcome to the fifteenth issue of the Columbia College Class of 1963 eNewsletter. Spring has really sprung, and I am off to my Shore house to do some gardening. So I thought I would get these notes out before I leave. Apologies for rushing a bit. I have not edited down the letters you will find further down in our Notes section. Thank you all for sending a last minute flurry. April's luncheon was attended by the usual convivial lot,, see the notes below for details. This month's lunch will be on Thursday, May 11. Future gatherings are scheduled for June 8, and July 13. Again, I hope you will remember that the Third Annual Parade of Classes will be on Tuesday, May 16 (Class Day) at Columbia. Each of the last 50 graduate classes marches proudly holding their Class Flag. Last year, I was the only 63er there, and we had to borrow a ringer from the Alumni Office to hold the other end. (See last June's eNewsletter for pictures.) I hope some of you will join me. We meet at Lerner Hall (in the Satow Room) at 8 AM for a great Continental Breakfast. March with the flags, and then enjoy great Class Day speeches. Let me know if you are going to join me. Keep those notes coming, and share with us your memories and your recent news. Please join your classmates for an informal lunch at the Columbia Club every second Thursday of the month. It is our hope that these gatherings will renew old friendships and foster improved relationship with our class and the College. This month, Thursday, May 11, 2006. The Fifteenth Second Thursday Class of 1963 lunch was held on April 20. Many of the regular Second Thursday Club members showed up, including Frank Partel, Larry Neuman, Steve Bauer, Bob Heller, Tom O'Connor, and Paul Neshamkin. A fabulous group as always. Here once again are portraits of the stellar gathering. 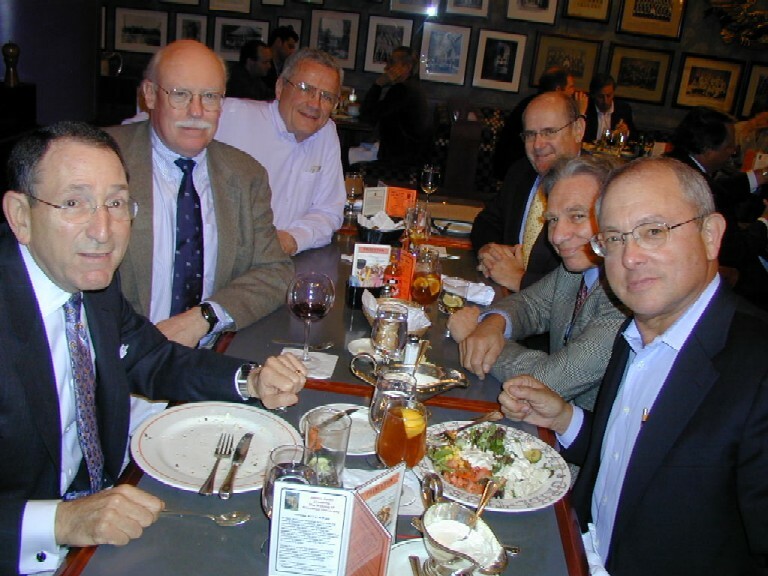 (From left to right): Frank Partel, Larry Neuman, Steve Bauer, Bob Heller, Paul Neshamkin, and Tom O'Connor. I hope you can all join us (please encourage your friends to come with you) at the next lunch on Thursday, May 11. Let me know if you will attend so that we can reserve a big enough table; RSVP to Paul Neshamkin (pauln@helpauthors.com). Here are the unedited (and unexpurgated) notes and news that you have sent in the last month. Thanks for filling my email box! Keep it up, it's always great to hear from you. All current College Match seniors have been accepted by at least one four-year college, and 95% of our students got into a top-ranked school. Moreover, our low-income students have been accepted at some of the finest colleges in the country including Harvard, Yale, Brown, Wellesley, Swarthmore, Williams, Pomona, Wesleyan, Bowdoin, Trinity, Mt. Holyoke, Rice, Brandeis, Claremont McKenna, Scripps, Bryn Mawr, Connecticut College, UC Berkeley, UCLA, UCSD, USC, Notre Dame, Michigan, Occidental, Embry-Riddle, NYU, Carnegie Mellon, Tufts, Macalester and Boston College. Needless to say, we are thrilled with these results. Recent articles in The Washington Post and The Wall Street Journal have indicated that 2006 has been the toughest college admissions year in years for students applying to selective colleges. A number of the most selective institutions have reported record low acceptance rates. Against this backdrop, the success of College Match students has been both remarkable and heartwarming." Cal Cohn writes, "I've been out of touch. Briefly: living in Houston with wonderful wife of 23 years, 2 great kids (one, 21 y.o.at Univ Texas, one, 19 y.o. at NYU transferring to Wash U. ); 2 clinical professorships; own my own psychiatric clinic (Fein-Jennings Clinic; 713-776-2400); basically a clinical psychopharmacologist and once a student and colleague of Julius Axelrod in the glory days. Any and all contacts welcome. 713 776 2400, home phone: we are just moving. As I leave this home where we raised our kids I am tying up loose ends, promises I'd made and not kept, of which writing this note is one. Best to all. ccohnmd@aol.com"
Jerry Epstein is working now on two grants. One is from NSF and involves developing and validating a test known as the Calculus Concept Inventory. The other involves retraining of elementary and middle school teachers and is a partnership with a NYC school district, also funded by NSF. His musical life is also doing very well. He sings traditional American folk songs and leads workshops for singers. He has recently returned from singing and teaching in Australia and New Zealand, and will do a concert in China in July with the help of a Columbia alumnus who is the US consular official for the northeast of China. He is happy to hear from any interested Columbia folks at jepstein@poly.edu. Michael Hassan is alive and well. He writes, "So sorry but am dealing with import problems with my largest customer and my stock broker just retired leaving me in a losing position, etc, etc...no time to do anything all weekend. I did get to Sudan, no business came out of it but it is an interesting place and I hope to send you something about my impressions when I get more time. On May 10th I head to South America for 5 month exploration which should generate many new stories....will do a better job writing on this safari." "I don't think there's been an update on me for decades, but I am working as a Senior Vice President at Millennium Credit Markets LLC. We have an office in Rockefeller Center and my primary responsibility is overseeing various placements of equity and debt in real estate transactions. I will retire shortly after I am forced out at gunpoint. At the moment I see no one carrying loaded weapons. I spend a lot of time in Weston Massachusetts where, today, the sun is shining and the trees are flowering or in leaf. We have had spring for the first time in several years. I keep meaning to catch up with your New York lunch group, and will do so as soon as I can." Lee Lownefish notes, "Your interesting e-mail address prompts me to ask about exactly how you help authors. I think you told us a while ago, but, alas, I wasn't paying attention. I just completed my fourth book on baseball, a new biography, Branch Rickey: Baseball's Ferocious Gentleman. It will be published in March by University of Nebraska Press, but as you well know, university presses pay little and promote less. I think I can self-promote somewhat because I did non-commercial sports commentary for years on WBAI and a little on WNYC in 2000. I am interested in doing more quality baseball writing - my books on the labor history of baseball, The Imperfect Diamond, two editions, and Tom Seaver's The Art of Pitching, were well received." Unfortunately, as I noted in my notes last year, my email address has nothing to do with what it sounds like -- I'm not a literary agent. So, I'm afraid I can't help. Actually what I'm an expert at is creating computer user assistance (Help file), thus the email address. Ezra H. Cohen writes, "You are doing a great job with the class notes, just as you did in the Van Am Society. I happened to receive recently an honor that I rather cherish. I was the recipient this year of the Pollard Award given annually by the Atlanta Bar Association to a lawyer or judge for professionalism and ethics in the practice of bankruptcy law. After Columbia and two years in the Army, I matriculated at Emory law School here in Atlanta and began practice with the predecessor of my present firm. I have primarily practiced bankruptcy law, except for three years in the late 1970's, when I served as United States Bankruptcy Judge for the Northern District of Georgia. " Thanks for the praise, Ezra. By the way, did you know the Van Am Society folded years ago. I wonder why? We certainly had a great time. How many of you remember the Dean's Drag? Peter Gollon also came through with promised news of his latest travels, "I've been travelling a lot lately - maybe too much. In February I went with my wife Abby Pariser '67B, daughter Kate, son David and his fiancee Mindy on a 10 day trip to Costa Rica. My children are now grown up enough that it's again fun to spend time with them, especially in new and exotic locations. Yes, the trip is a bribe for their company, but they're well worth it. A few weeks after that, I went off on a business trip to Hong Kong. As I've gotten older, I have learned that its both possible and desirable to add a few days to these trips for enjoyment and recovery from jet lag. One afternoon I took the ferry across to Kowloon, and was greeted by several 6th grade girls (see photo) practicing their English by taking a survey of tourists under their teacher's supervision. This trip I spent two days on nearby Macau - a former Portuguese colony for several hundred years until it reverted back to China in 1999, similar to the recent history of Hong Kong. But while Hong Kong has been a bustling trade center for most of its history, Macau has been a backwater....until its recent emergence as a tourist attraction. Many of its buildings and cityscapes such as the Largo do Senado (Senate Square) look as if they were imported from 19th century Portugal...but then you walk around the corner and it's all Chinese. Absolutely charming, except for a dozen newly built Las Vegas style mega-casinos." As you saw above, I've added a link to Peter's photos. If you want to send any pictures of yourself, family, friends, or trips; anything you'd like to share with your classmates, just attach them to an email message, and I will link them to this eNewsletter. I look forward to seeing what you are up to.